The Jeep Renegade is a compact crossover that’s been designed and developed in the USA, is based on a heavily modified Fiat platform, and is built in Italy alongside the Fiat 500X. Powered by a choice of two different gasoline engines, the Renegade offers clutch-driven lockable permanent four-wheel drive, an ultra-short crawler transmission ratio, hill descent control and a generous ground clearance height. The 2016 Jeep Renegade base Sport and Latitude trims are offered with a 1.4-liter turbocharged four-cylinder engine and 6-speed manual transmission as standard equipment – no automatic. The “MultiAir” turbo four-cylinder makes 160 horsepower and 184 lb-ft of torque. The Limited and Trailhawk are fitted with a larger 2.4-liter “Tigershark” four-cylinder and nine-speed automatic. The Tigershark engine has an output of 180 horsepower and 175 lb-ft of torque. Jeep offers both powertrains with front-wheel drive or all-wheel drive. For serious off-road excursions, the Trailhawk features a low-range transfer case designed specifically to handle the rigors of off-roading. 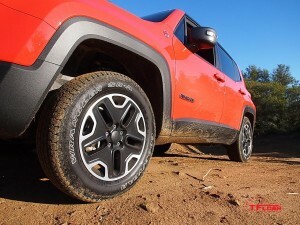 Borrowed from the Jeep Cherokee, the Renegade comes with Jeep Active Drive, which is dedicated four-wheel-drive with a disconnecting rear axle that provides 4X4 traction when needed, but reverts to front-wheel traction under normal road conditions for improved fuel economy. This system includes Jeep Selec-Terrain with modes selected by a rotary knob. These are Auto, Snow, Sand and Mud. If you opt from the off-road optimized Trailhawk model, there is a Rock mode which provides Jeep Trail Rated ability, which means it can go just about anywhere. Price for the FWD model ranges from $17,995 to $25,120. Four-wheel drive models start at $19,995 for the Sport model and top out at $27,120 for the Limited. After driving the Renegade, we found it to be a spry, fun vehicle able to drive in lots of conditions. Additionally, Jeep claims that the Trailhawk will be the most off-road-friendly compact crossover, which we have no reason to doubt, equipped as it is with a lifted suspension, terrain management system, excellent tires, and Jeep Active Drive all-wheel drive system. The Jeep Renegade Trailhawk and the Jeep Wrangler are two very off-road worthy vehicles, but which one of these is better off-road in the ice and snow? Watch this TFLcar video to find out.